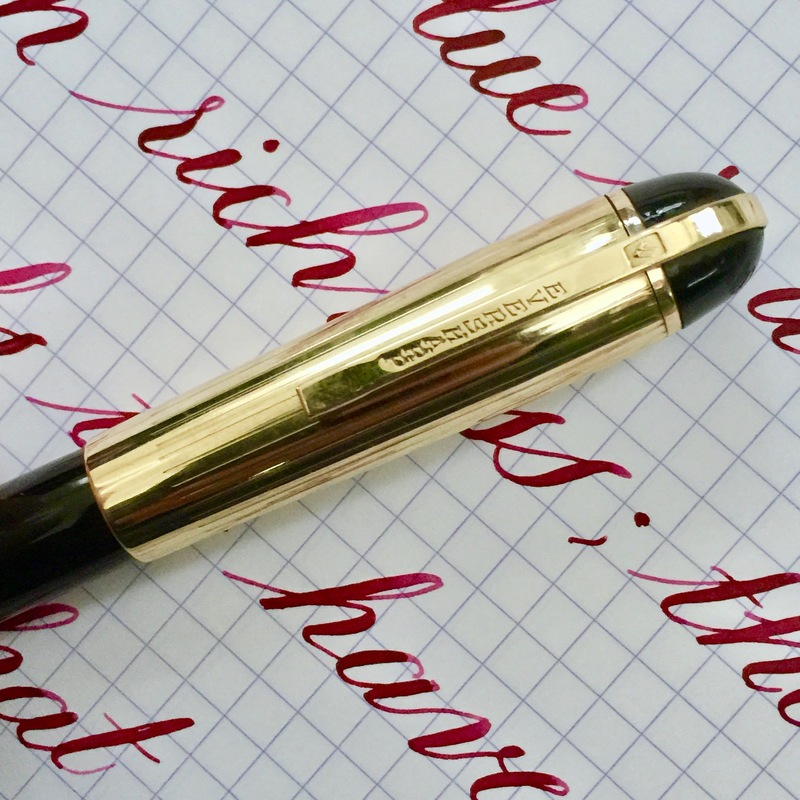 This Wahl-Eversharp Skyline comes in a black body with gold-filled trim. The cap on this particular Skyline is the more uncommon vertical pinstripe (as opposed to the horizontal stripe most commonly seen). 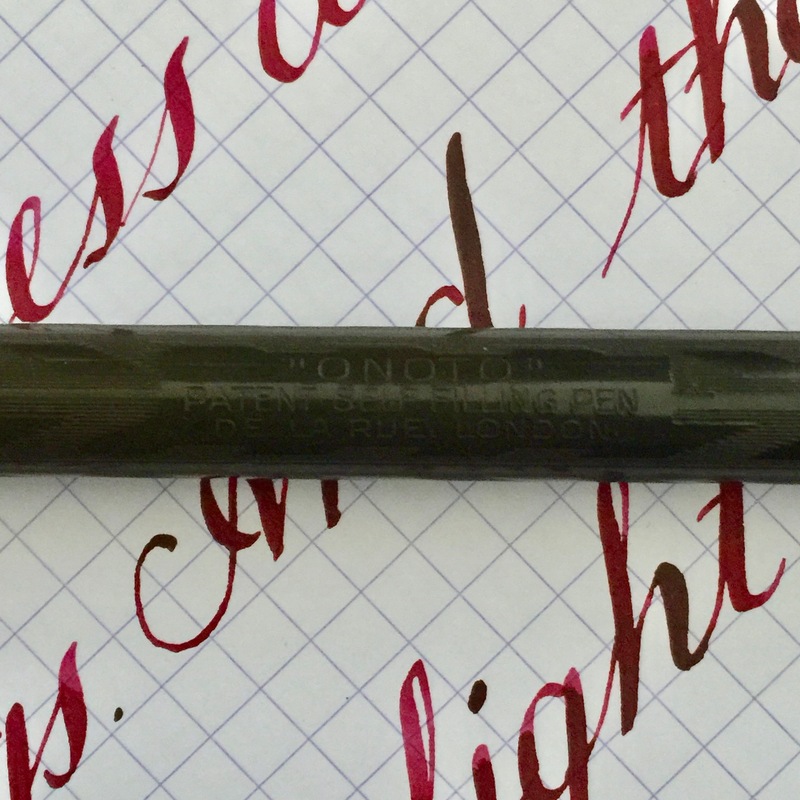 The body of the pen is in good condition with only light surface marks from normal use that show up due to the glossy black surface. There is no brassing on the gold-filled trim. There is very light surface scratching on the cap from normal use. There are also two small dings on back side of the cap. The clip and lever are in great condition. 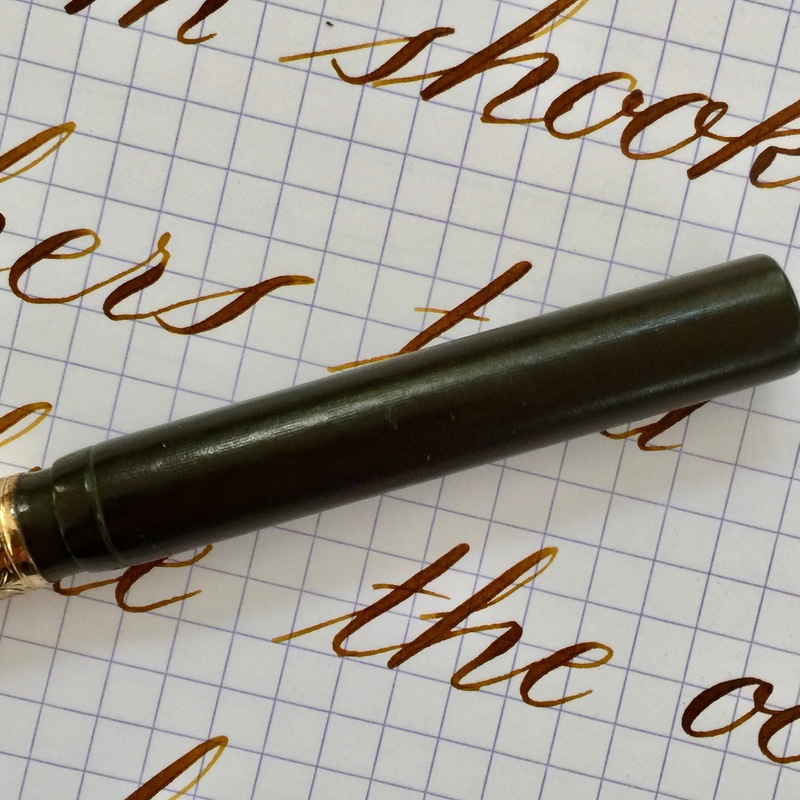 This pen also has a section with the convenient amber ink window. The window is still pretty transparent and works well. The 14kt. 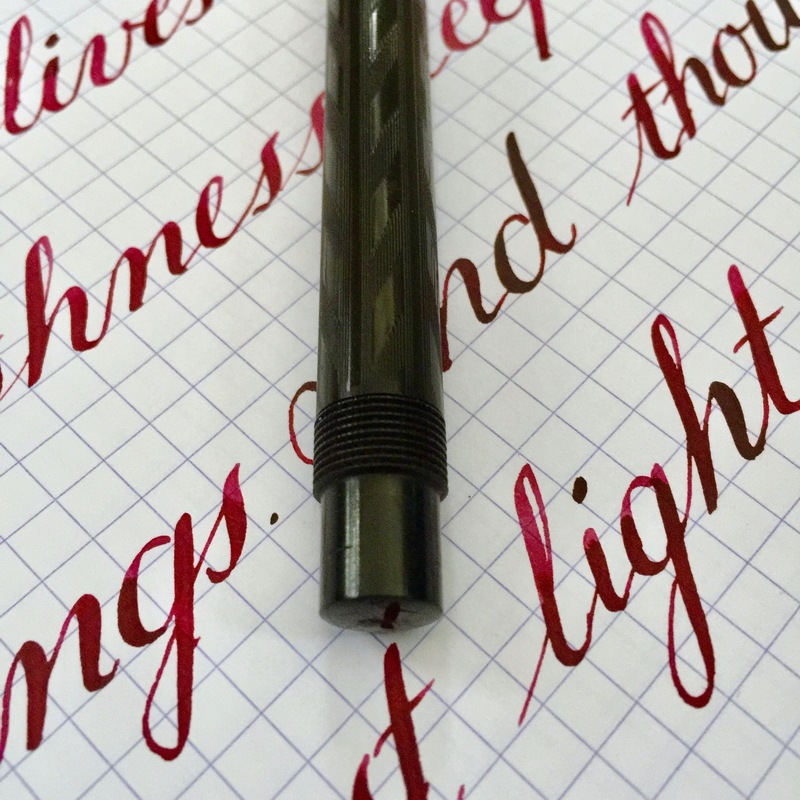 Eversharp is a lovely writing F (0.4mm). It is wet and smooth with a bit of a squeak. 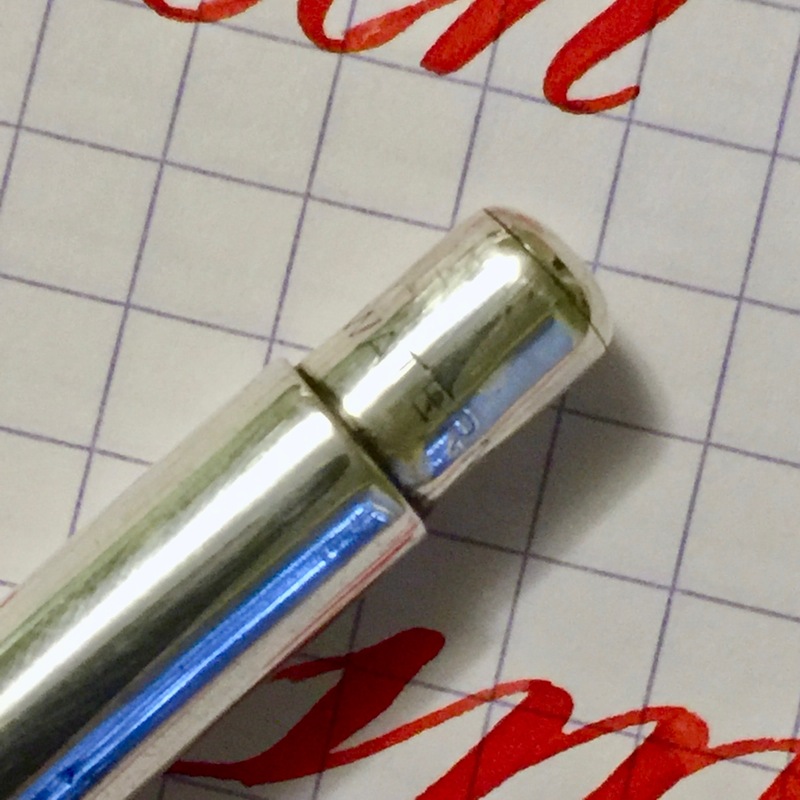 The flex on this nib is good ranging up to BBB (1.7mm). Responsiveness is pretty decent. 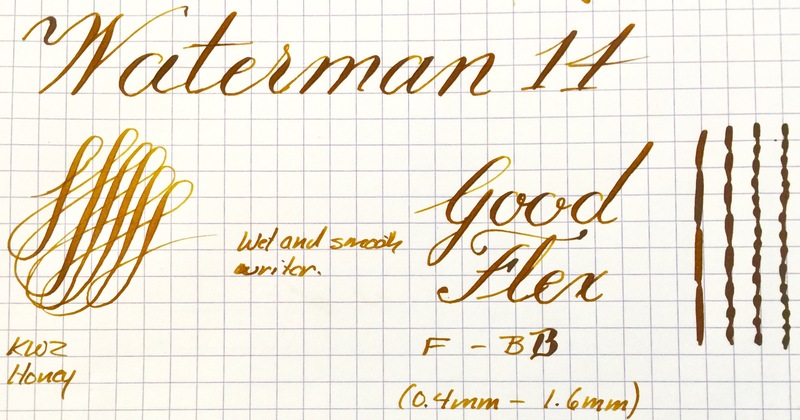 The flex does come a bit stiff for a “super flex” grade, so I’ve graded it somewhere between “good” and “super” flex. Still its a lovely Skyline. 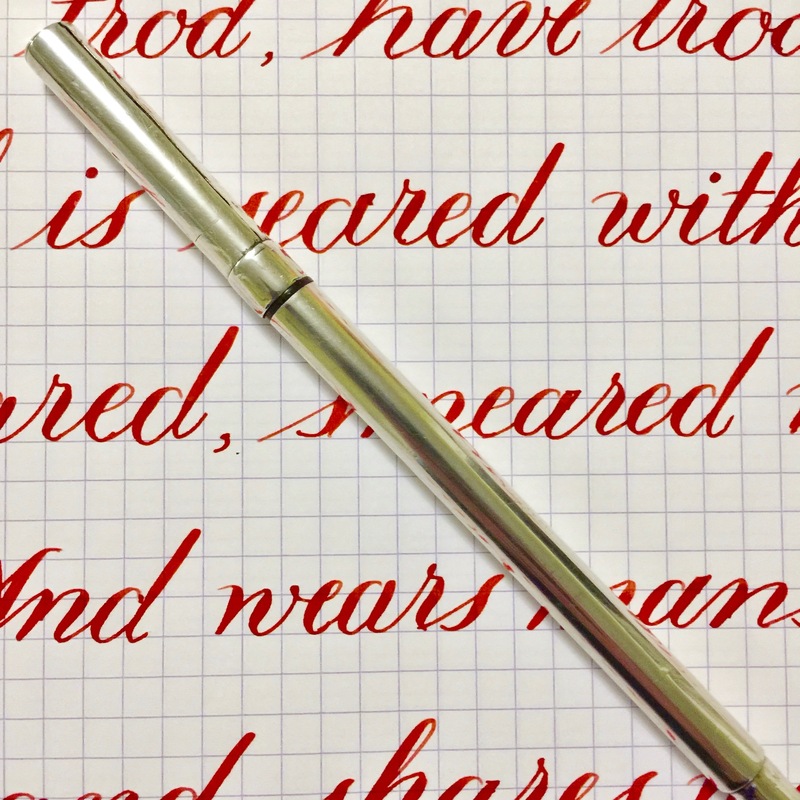 Here is a vintage Waterman 52 1/2 V in Waterman’s classic red ripple hard rubber. 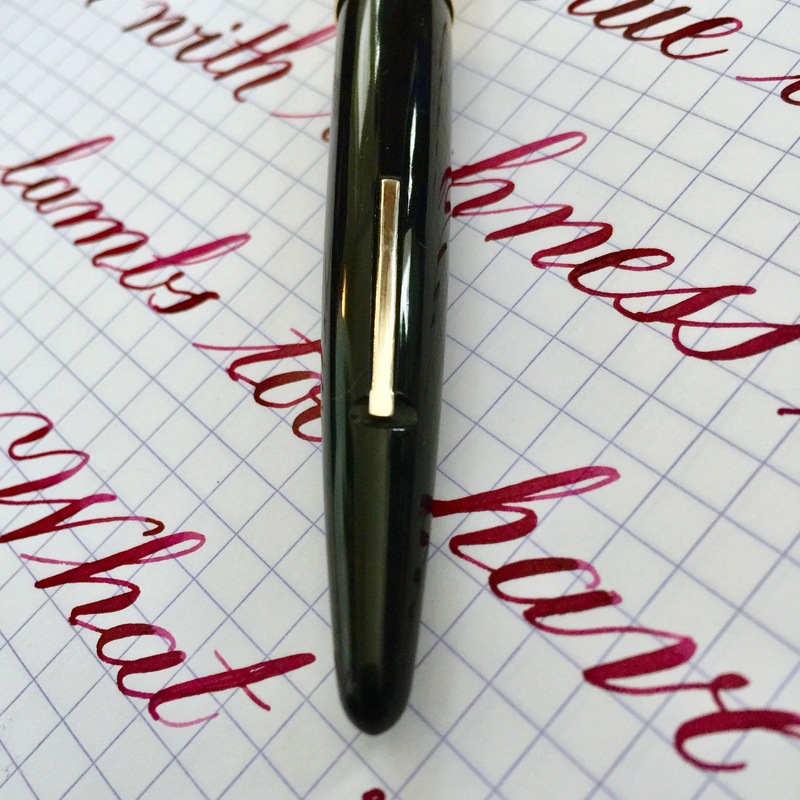 The pen is in superb condition. The red ripple hard rubber has very little fading. Very close to the original color. The gold-filled trim looks excellent with little to no braising or even much wear on the lever, band, or ring top. The imprints also show little sign of wear. 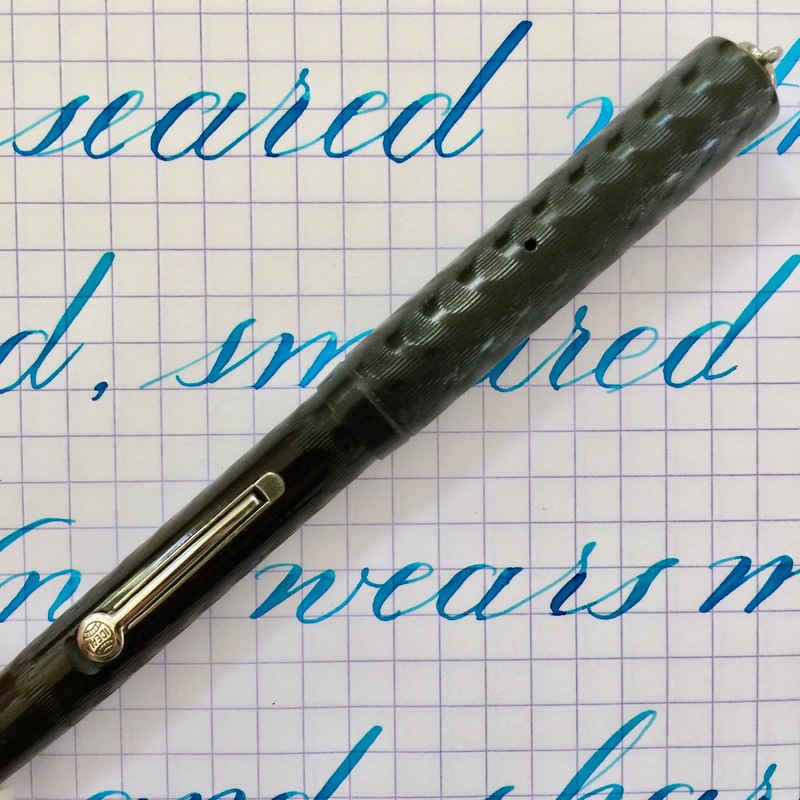 The Waterman #2 is a lovely vintage flex nib. Normally, this writes as an XF that is slightly stubbish (a bit broader on the downstroke and thinner on the side stroke). 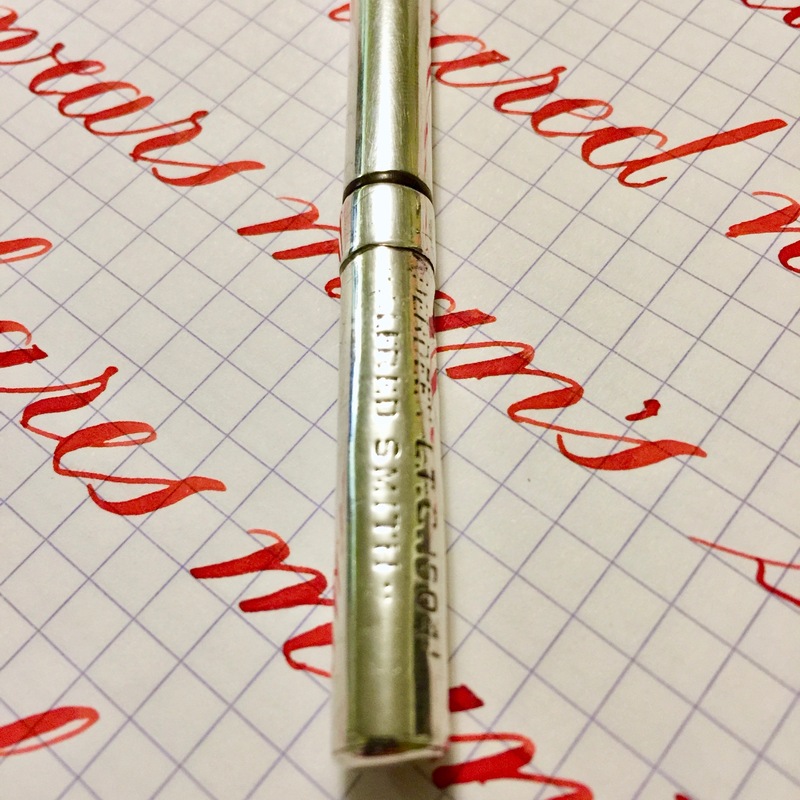 The flex on this pen is superb. 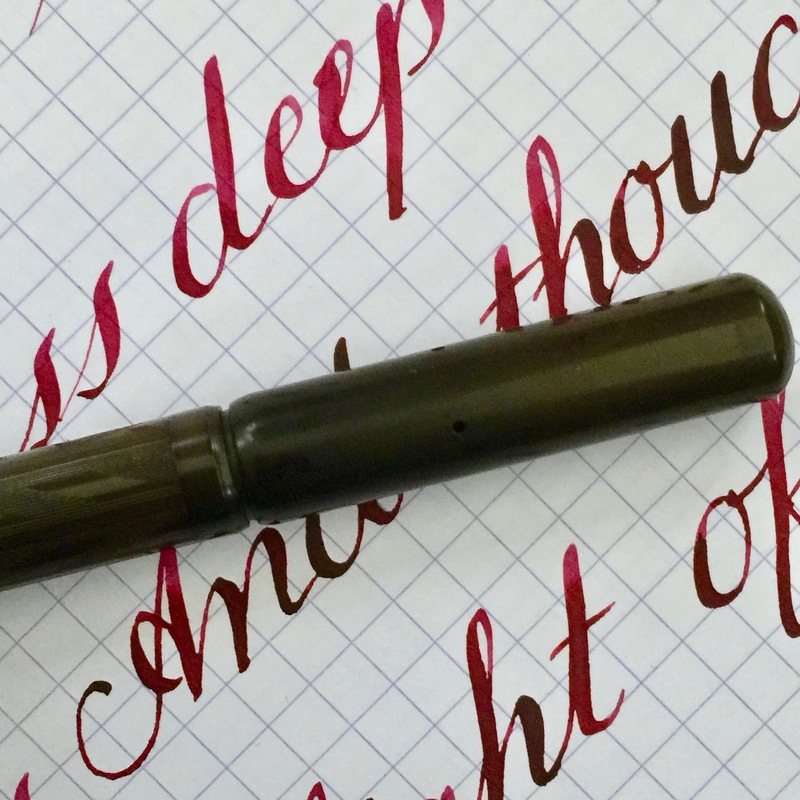 The range is good going from XF-BB (0.3mm-1.5mm), but it is the responsiveness of this nib that sets it apart. The flex comes with ease. It’s not quite a wet noodle, but it is getting close. 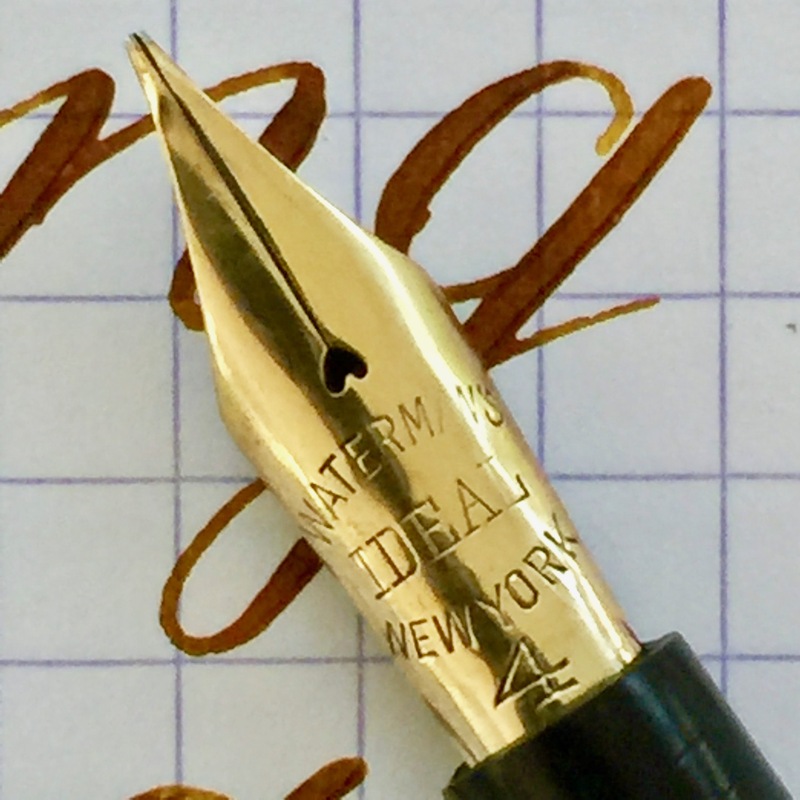 The snappy responsive nature of the nib allows for beautiful line variations even on very small scale. 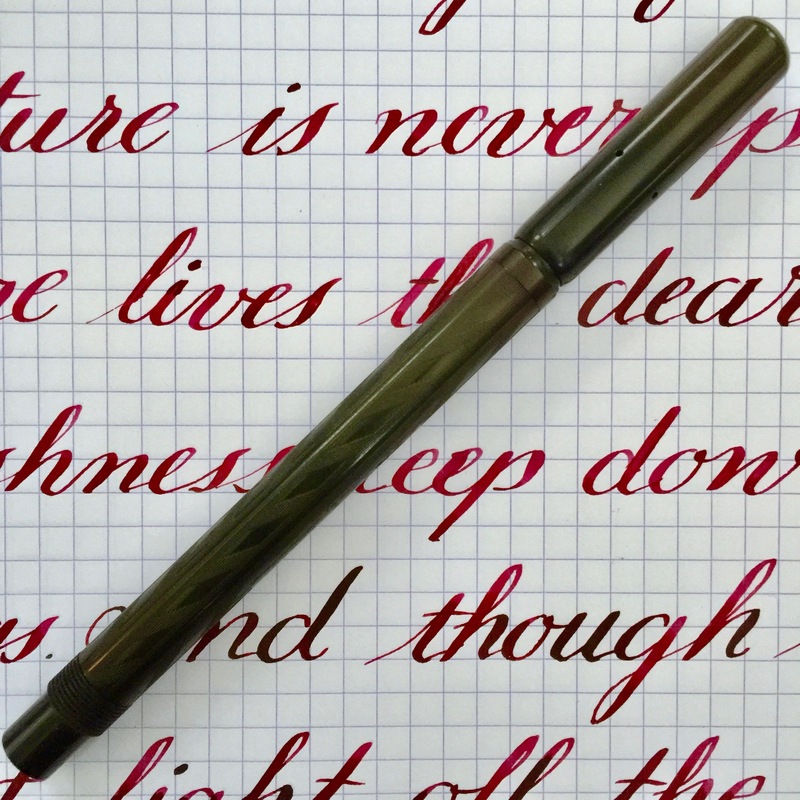 Great flex nib in a fantastic red ripple body. 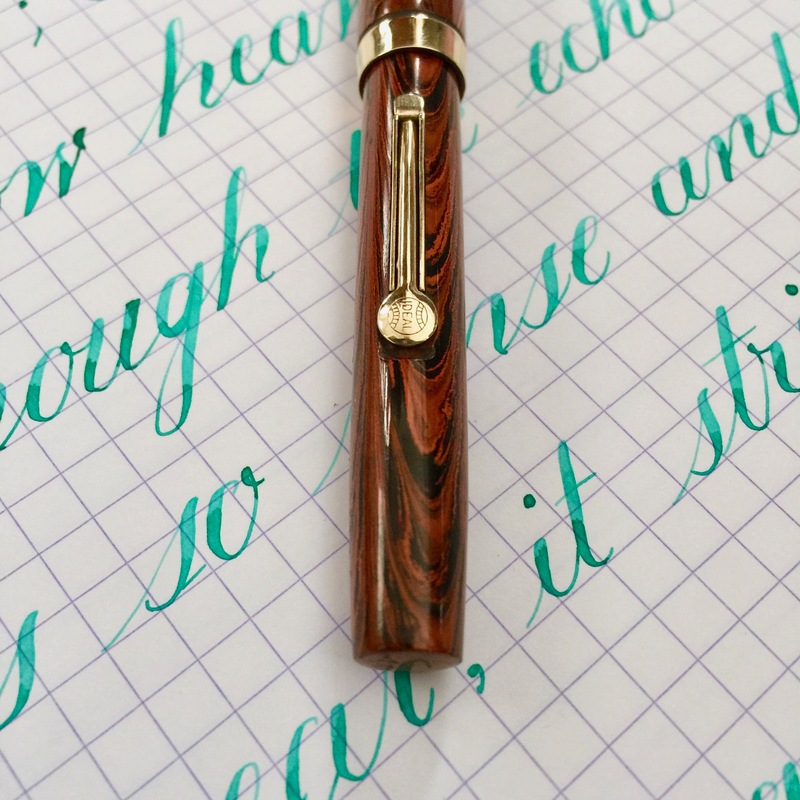 Here is a very unique pen. 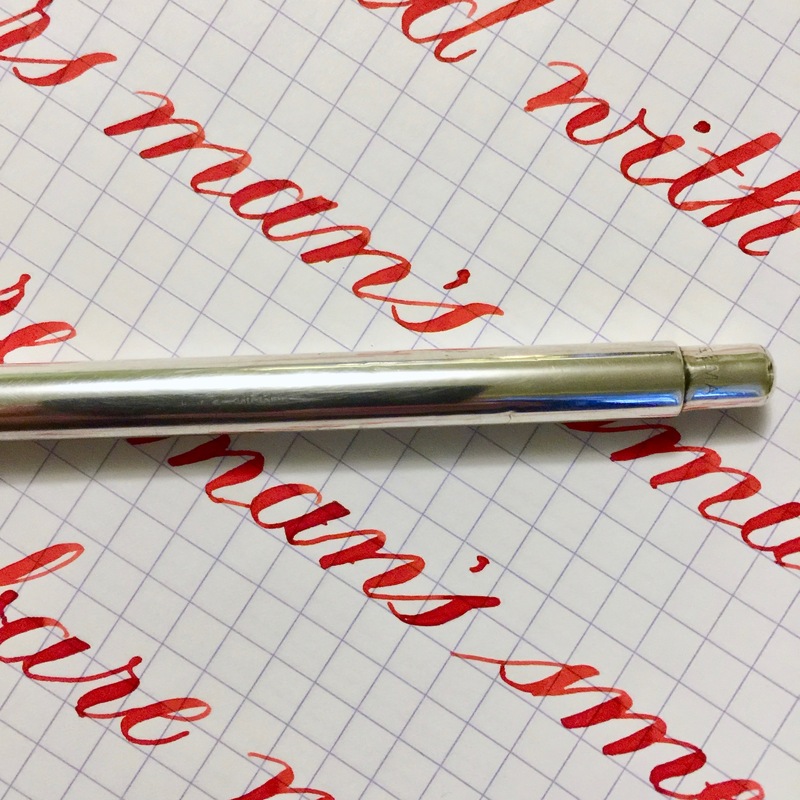 It’s a Waterman 402 with a smooth sterling silver overlay. A smooth, shiny overlay of this size is extremely difficult to keep in perfect condition. They are highly susceptible dents, scratches, etc. and the shiny surface hides nothing. 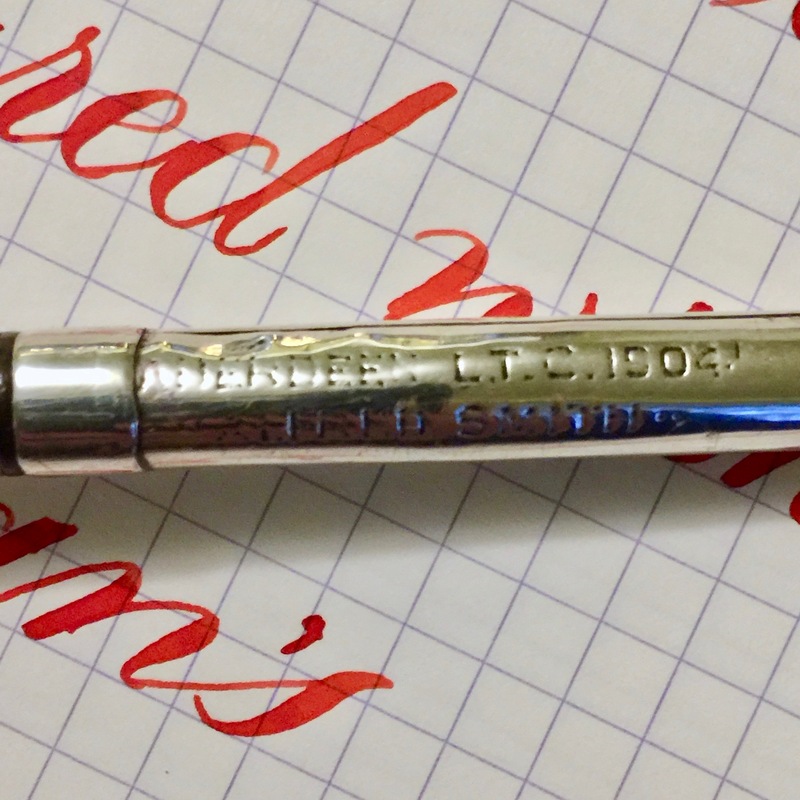 Having said that the body of this pen is in pretty decent condition. Only a few very small dents and some light scratching. The cap, however, is another matter. Something caused the overlay the split apart. The pen would be in great condition if it wasn’t for this blemish. The cap has an inscription that reads “Aberdeen, L.T. C. 1904” on the top line and Alfred Smith below that. I believe it refers to Aberdeen Scotland and “L.T. C.” stands for Lieutenant Colonel. Anyway, it’s clearly a pen well over a hundred years old, and has possibly seen a World War or two. 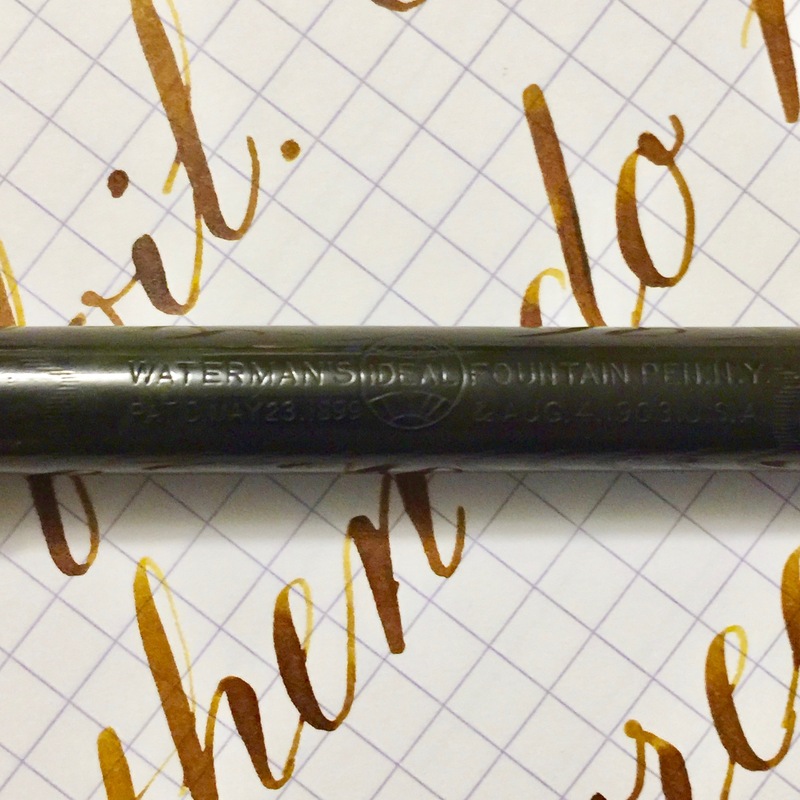 There is also “Waterman” imprint at the end of the barrel. The 14kt. 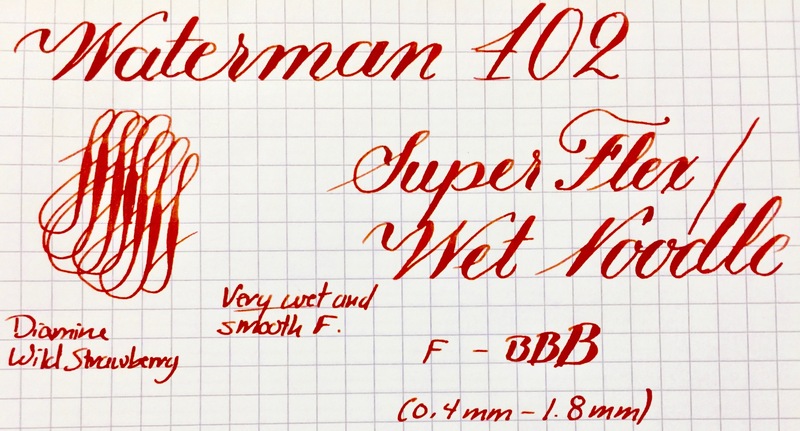 Waterman #2 is a very wet and beautifully smooth writing F. It really feels more like a medium due to it’s juicy nature. 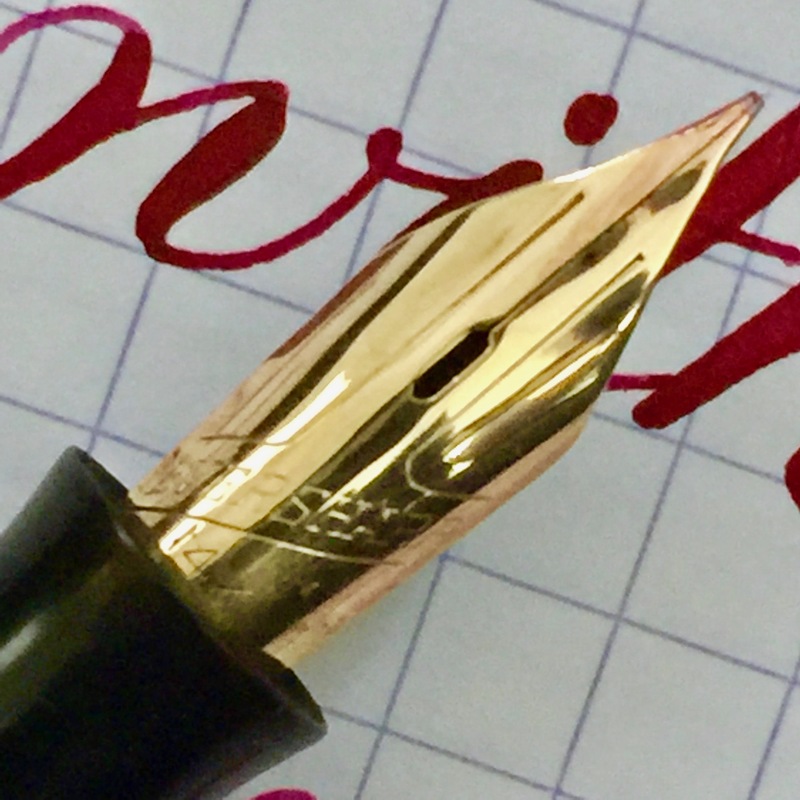 The flex on this nib is great and very easy. 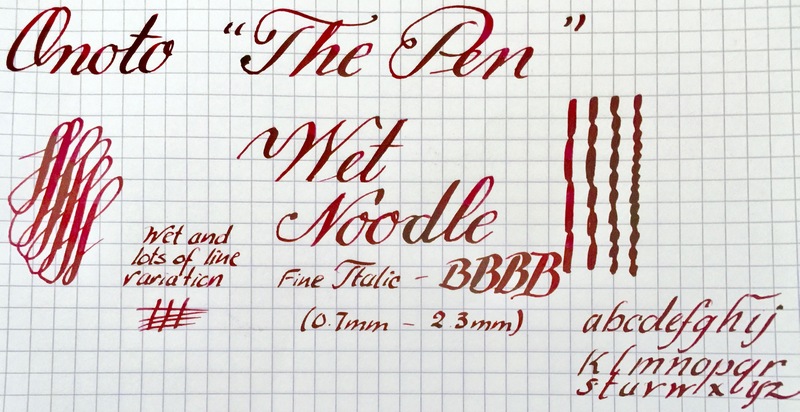 It’s really on the border between a “wet noodle” and a “super flex” nib. The output for flex is pretty good, but with some inks you may experience a railroad here and there. 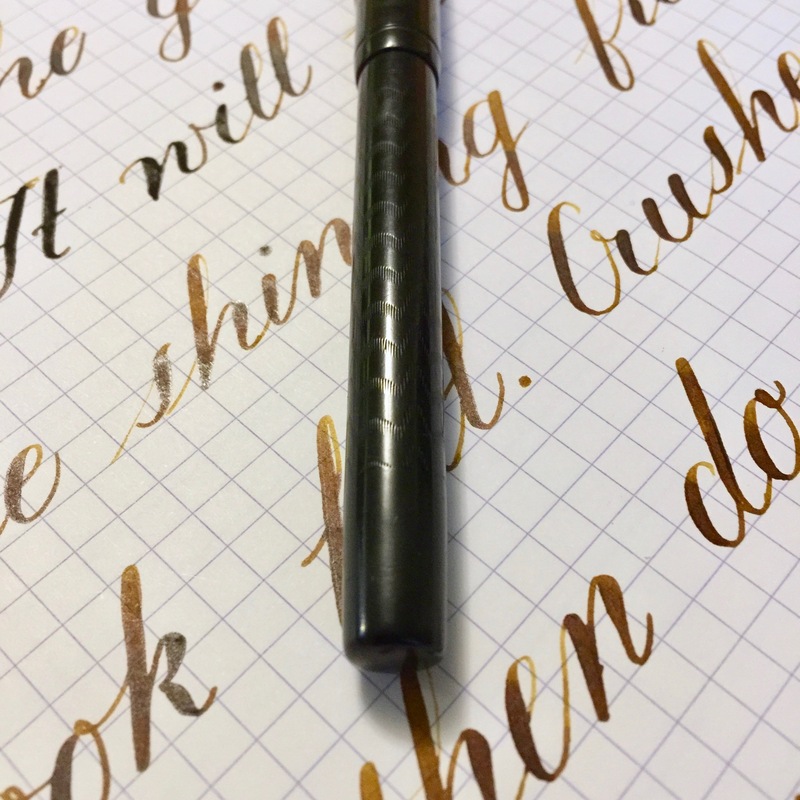 But the ink always picks right back up. 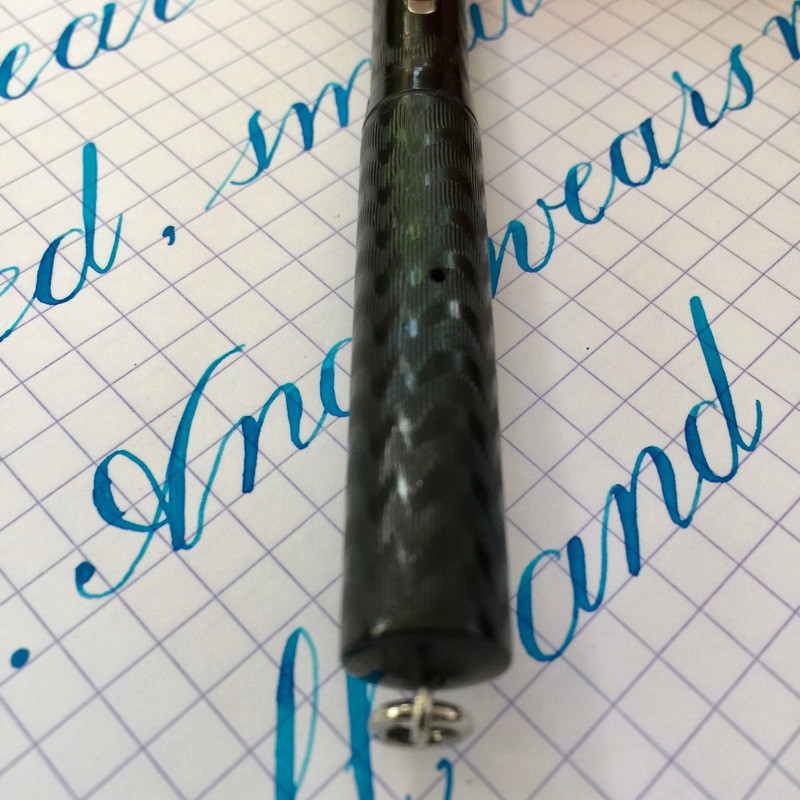 Overall, a very unique pen. 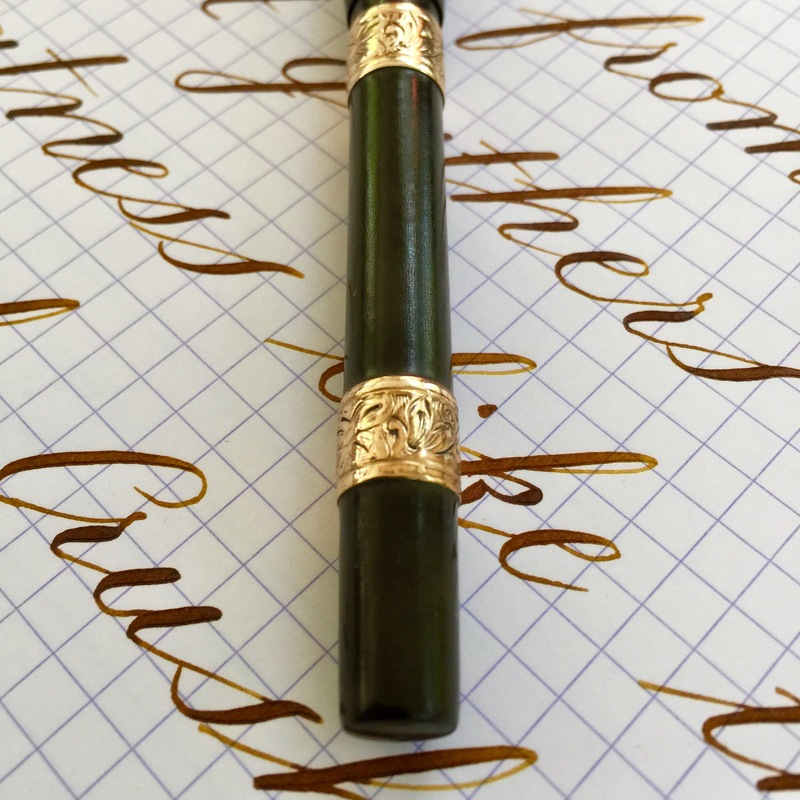 This is a fantastic, hundred year old Waterman 14 eye dropper pen with gorgeous gold-filled repousse bands. The original black hard rubber body has faded to a dark brown but is still quite dark. The original chasing has almost completely worn off. The imprint on the side of the barrel is quite worn and not really legible. The “14” imprint on the end of the barrel is worn some but easily read. The artful repousse bands are in good condition, but do have some braising along the top and bottom edges of the band. 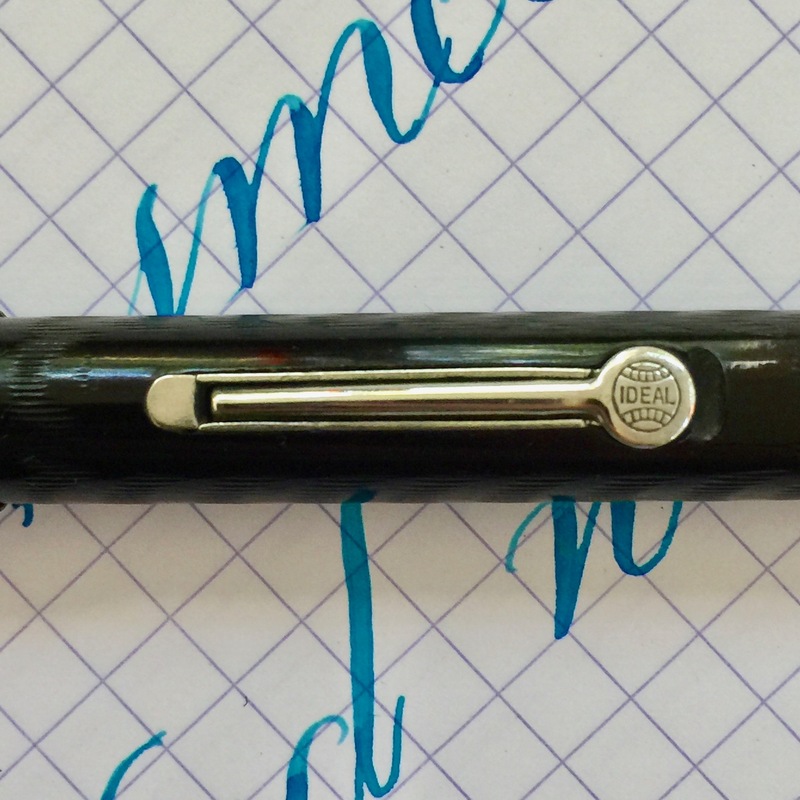 The nib on this pen is a hard one to part with. The 14kt. 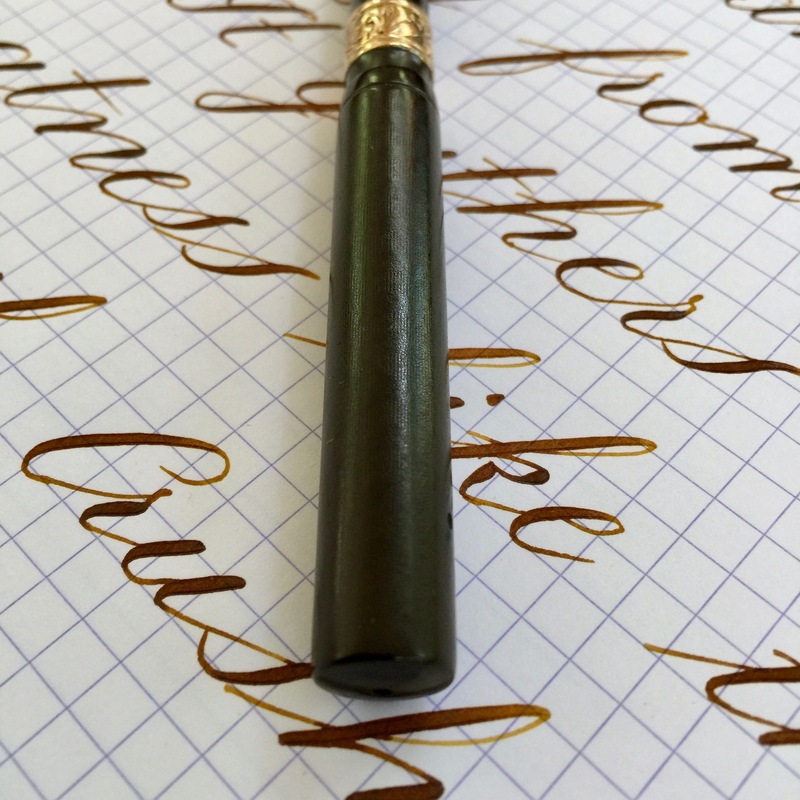 Waterman #4 is about as smooth and elegant XF nib you will ever find. 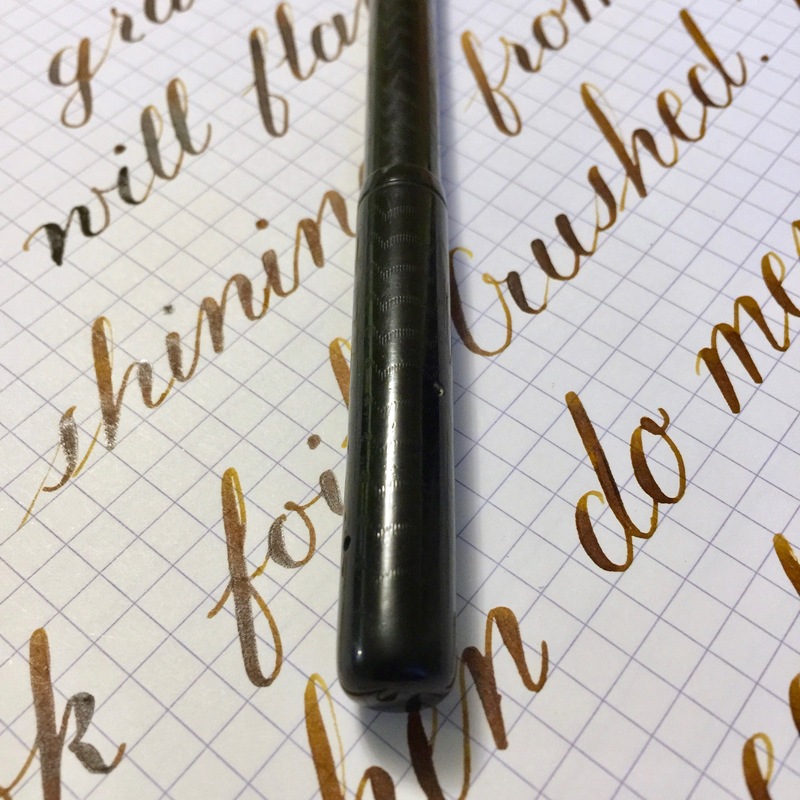 Those long tines and the smooth extra fine point create a sophisticated experience in writing you can only acquire in vintage nibs. 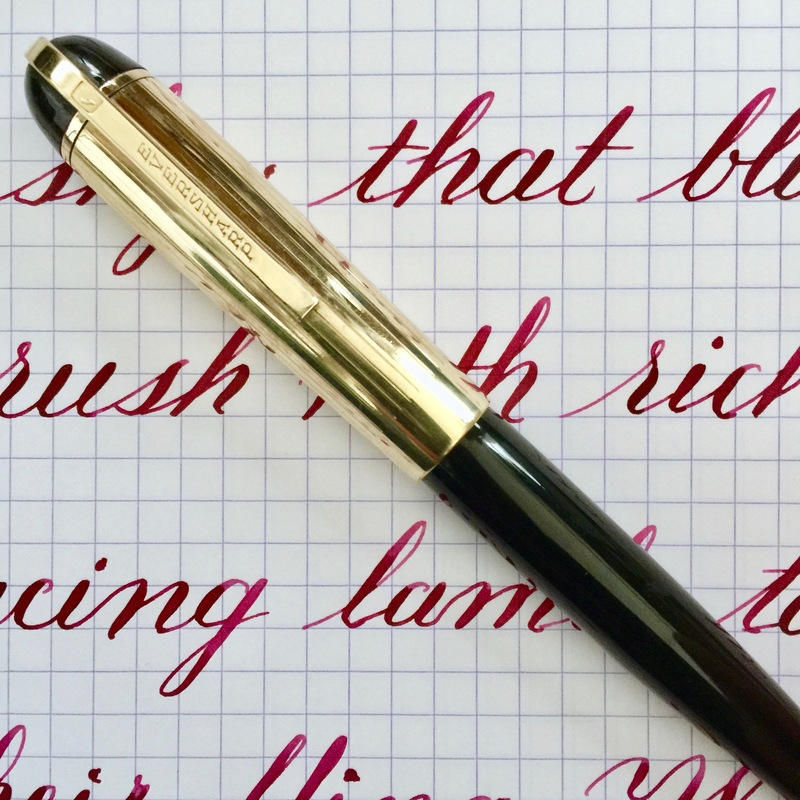 The nib does also have some flex as the samples suggest. 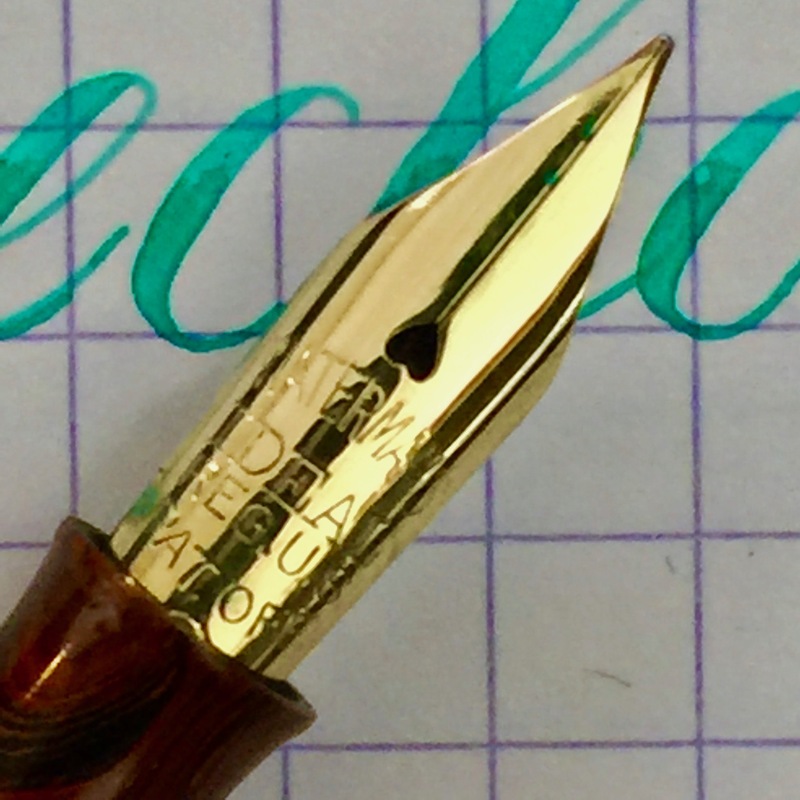 Some would call this a “semi-flex” nib. The flow is great, responsiveness is decent. It’s just a bit firm. 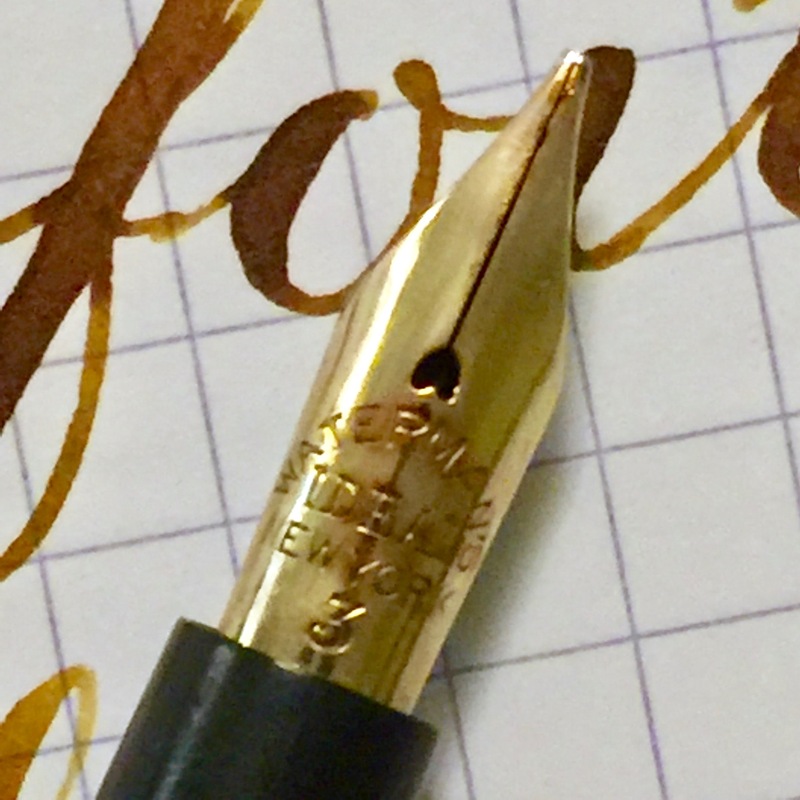 Flex, I would say, is more of a side feature of this nib and not the main show. 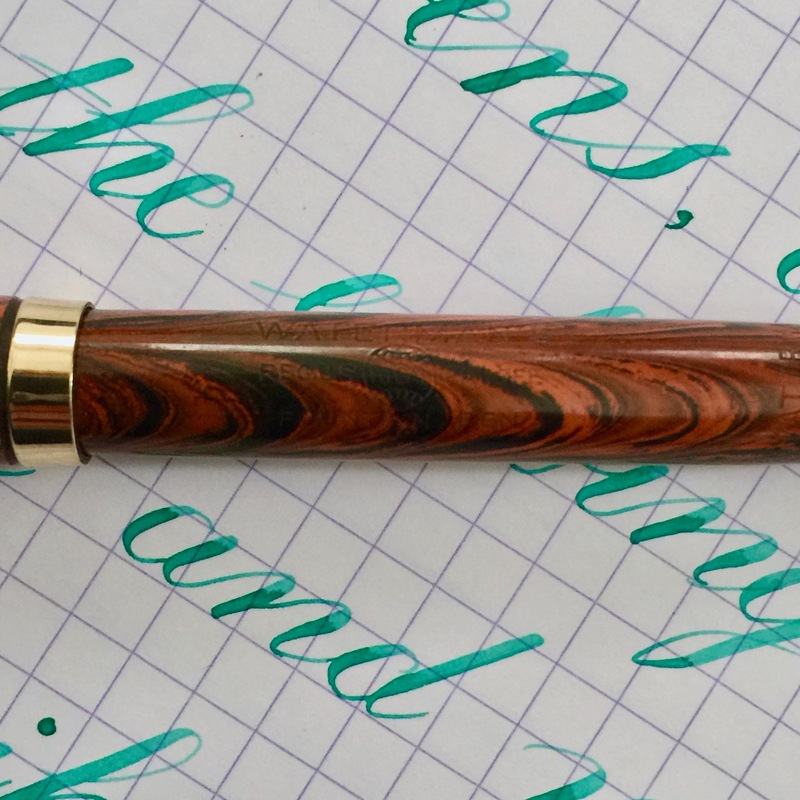 Here is a Waterman 12 eye dropper pen. The black hard rubber body has faded some to a very dark blackish brown. 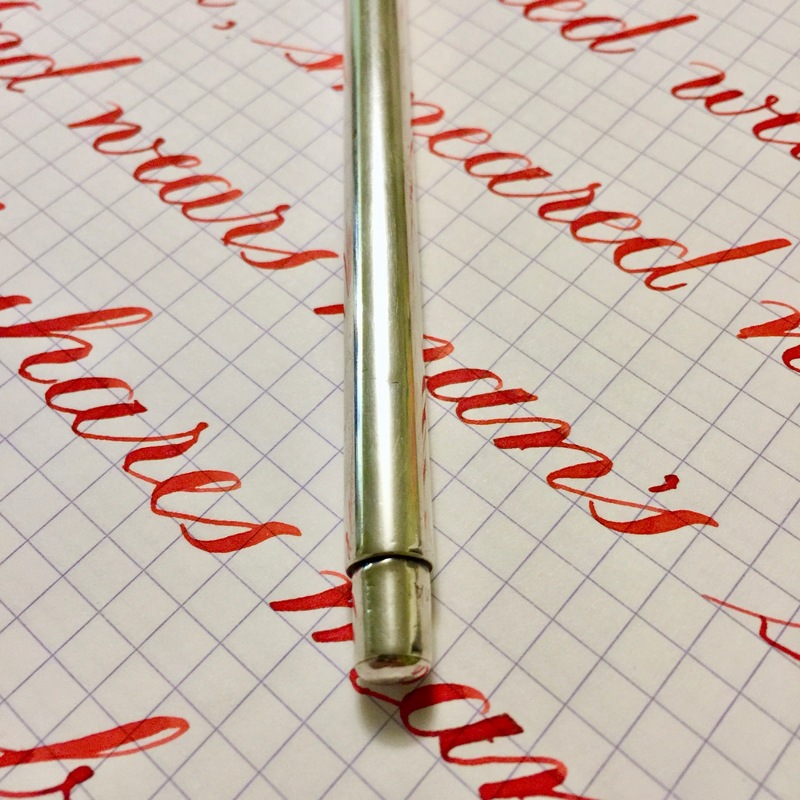 The chasing on this pen is quite worn. It’s visible but without much texture. The imprints are good and crisp and easily readable. 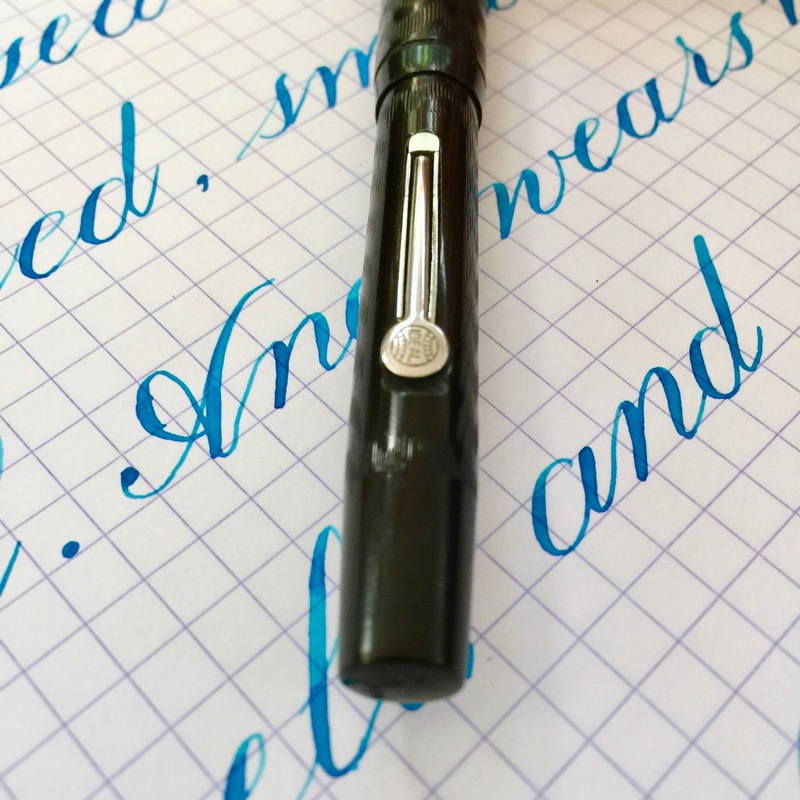 The nib on this pen is quite interesting. 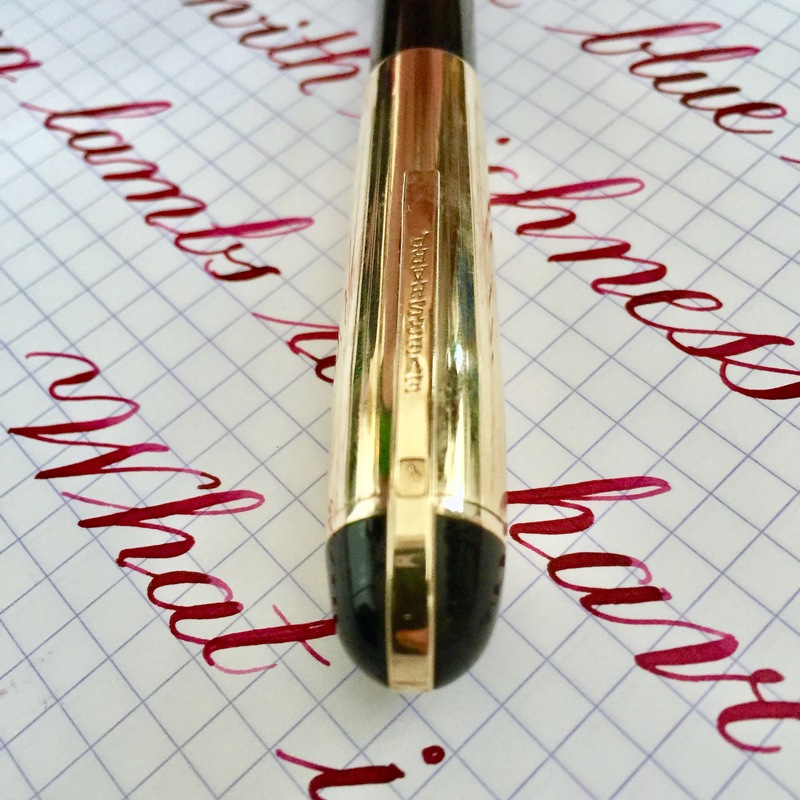 I found this 12 in the “wild” nibless and decided to pair it with 14kt. 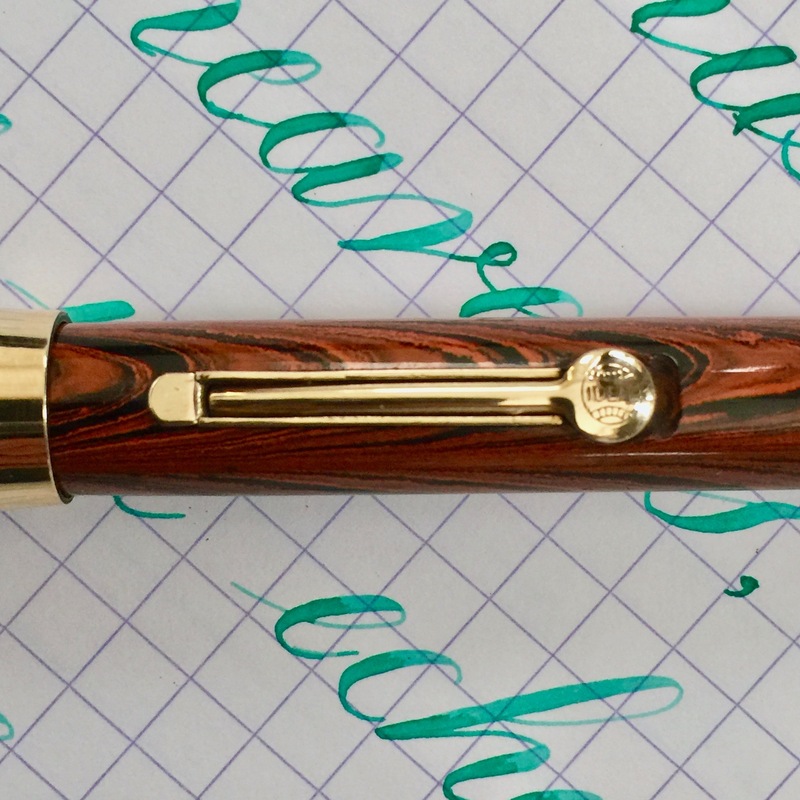 Waterman #3. I know, I know, it’s a 12 and should have a #2. 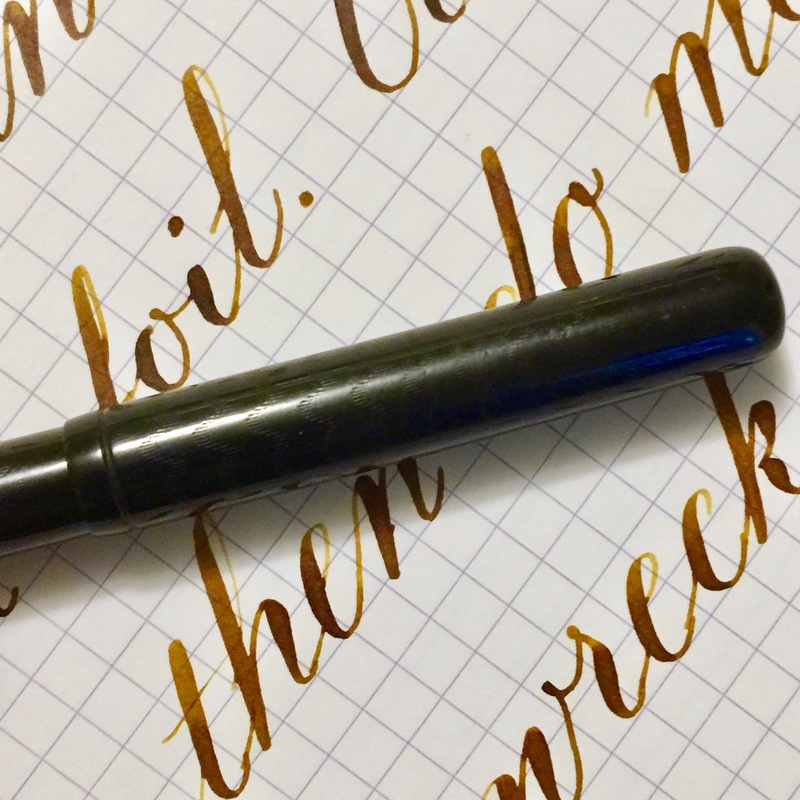 But I’ve been tracking down a 13 for this nib forever with little success, and the nib is just too nice to not be used. 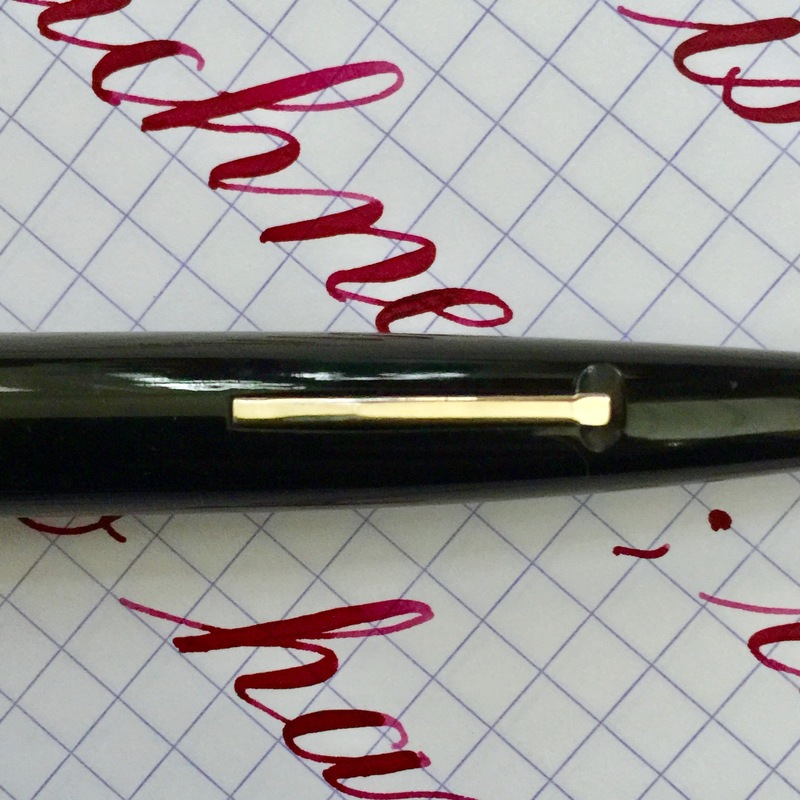 A good heat set of the nib and feed (which I do with all my vintage pens) took care of any slight size differences. 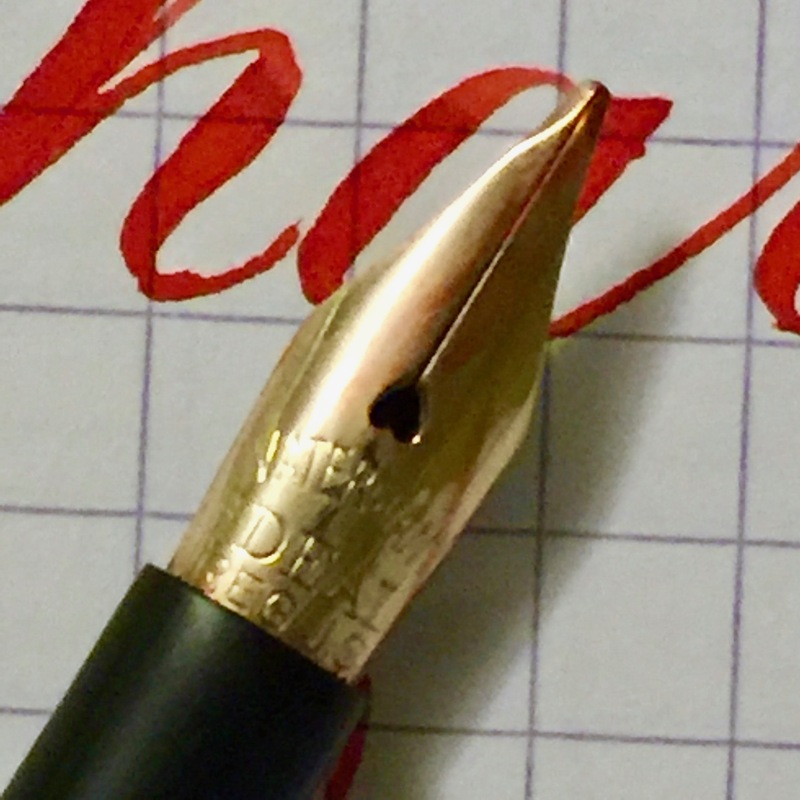 The base of this nib is huge, so it’s not sliding around any. It’s a very fine stub really with some decent line variation. Not quite an “italic”. The flow keeps up nicely, but I wouldn’t call this a “wet” stub. It’s a great writer that adds character. 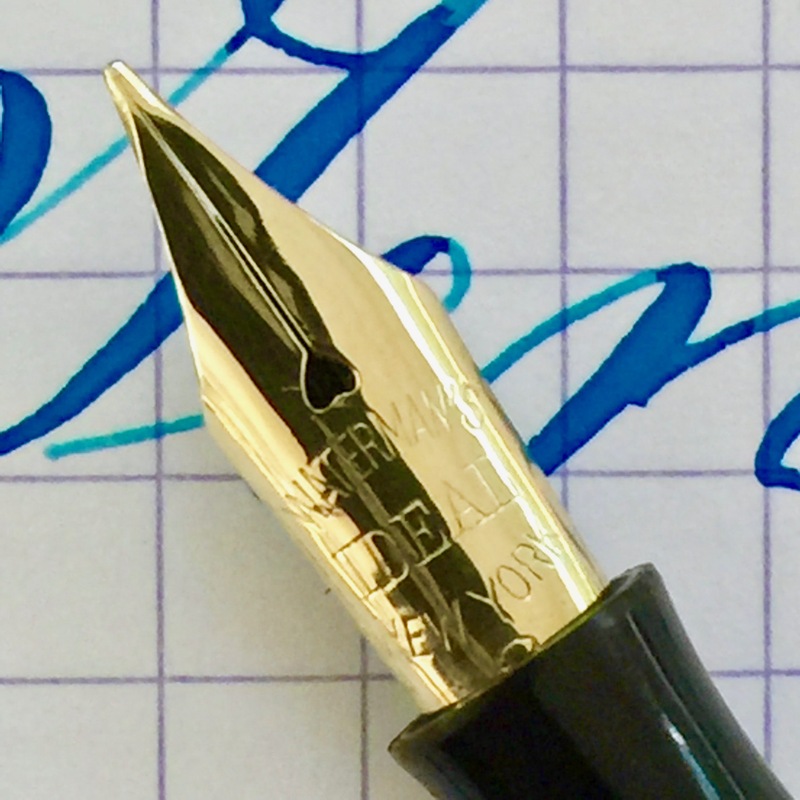 The nicest feature of the nib is it’s flex. 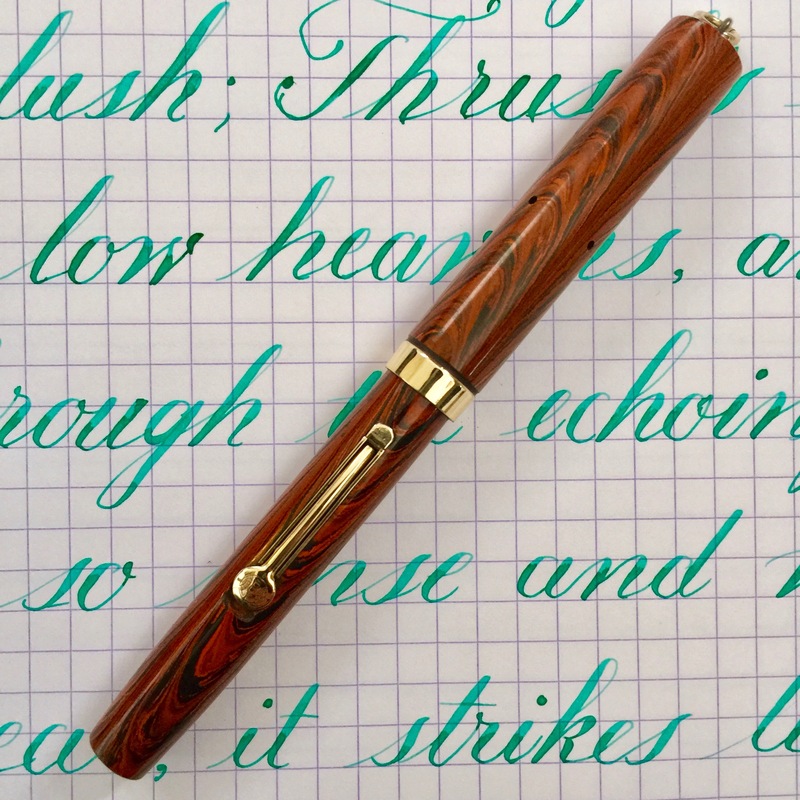 This is a soft super flex nib with a great range, very good responsiveness. It’s getting pretty close to “wet noodle” status but not quite. 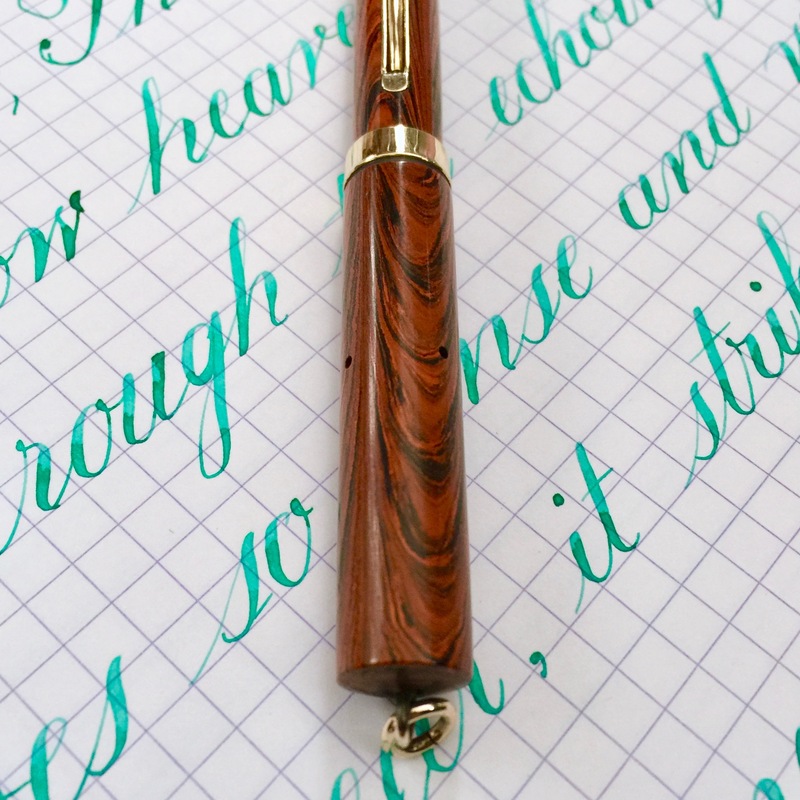 A really nice pen and nib. 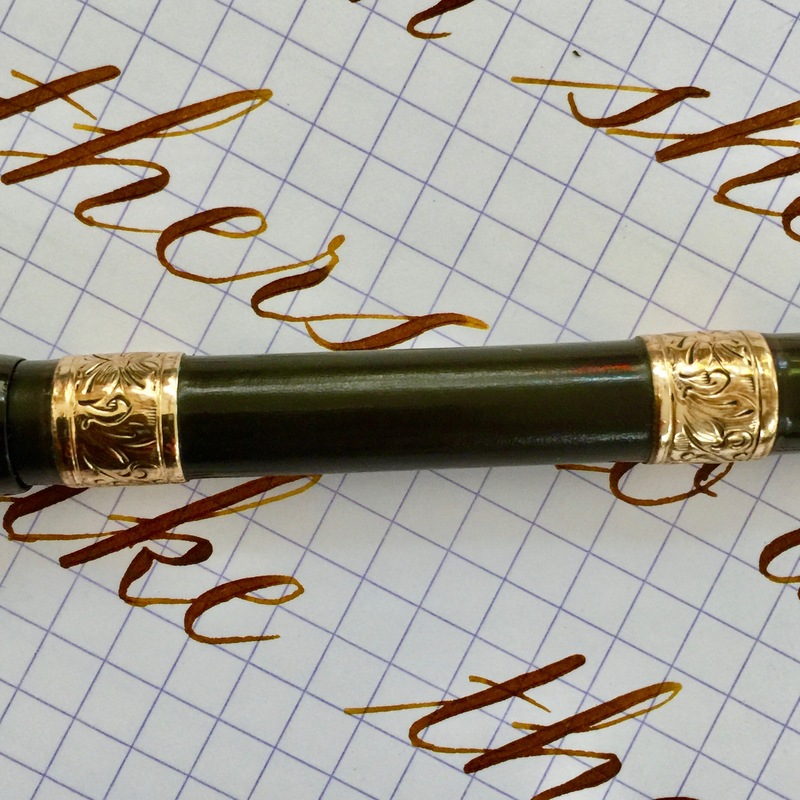 This vintage Waterman 52 1/2 V is really in fantastic condition. 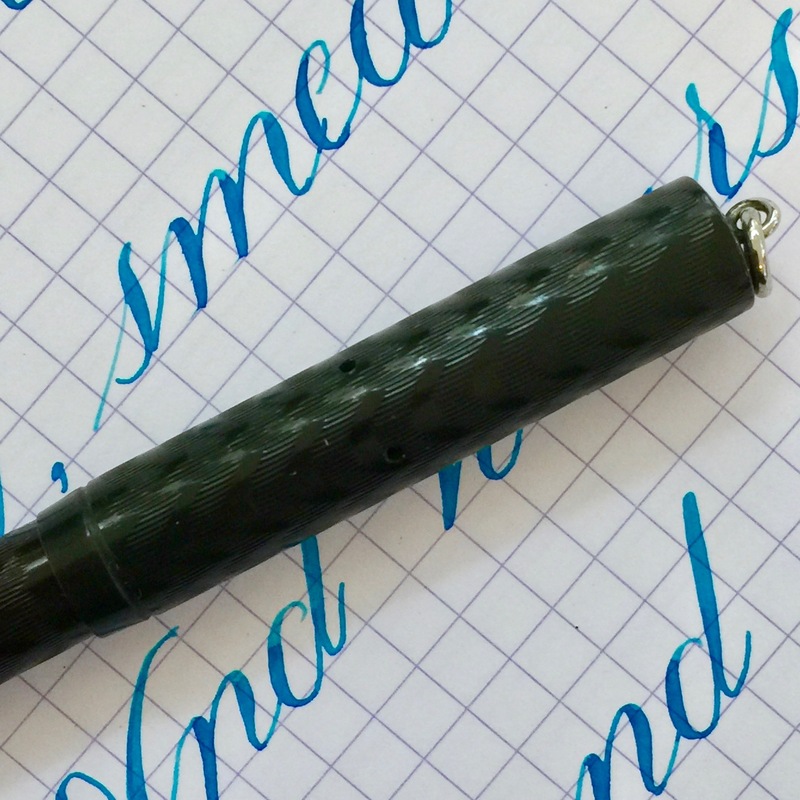 The black chased hard rubber body is still very black with little to no fading. The chasing is also good and crisp as well as all the imprints. 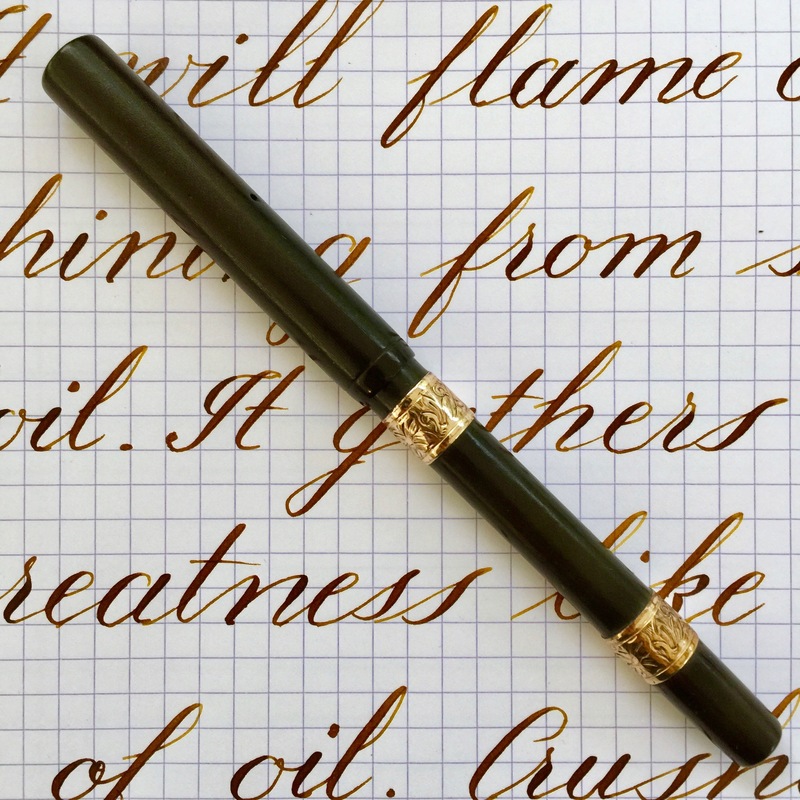 The pen really looks to have hardly ever been used. The nickel trim also looks near perfect. 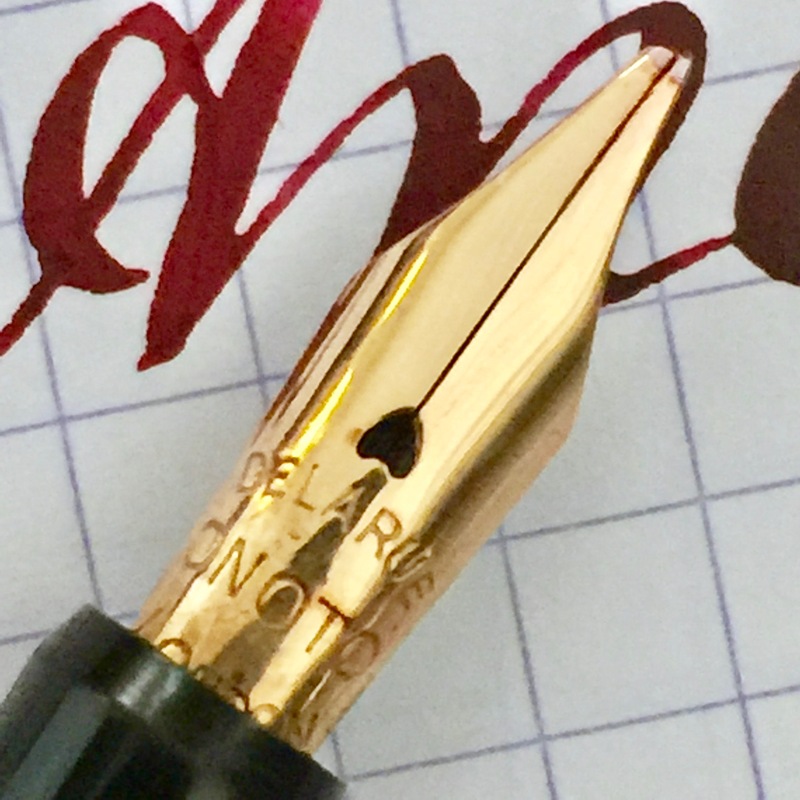 The most essential part of any pen, the nib, is lovely as well. The 14kt. 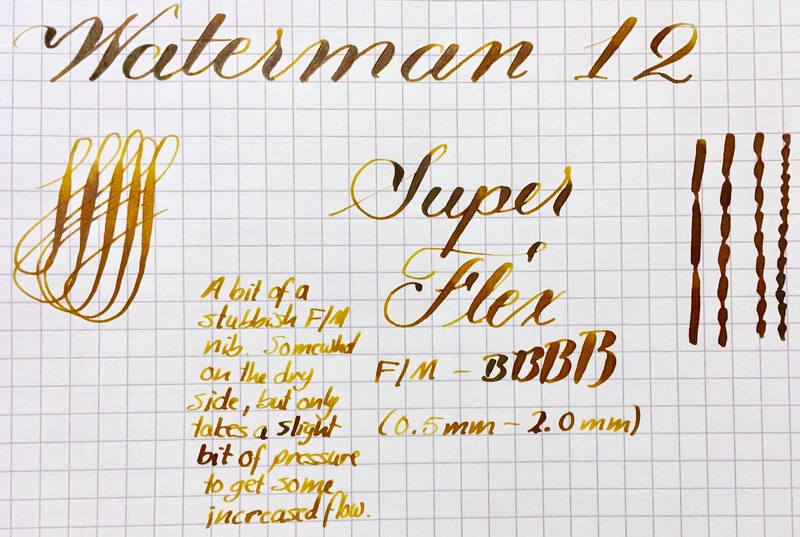 Waterman #2 is a wet and butter smooth XF. 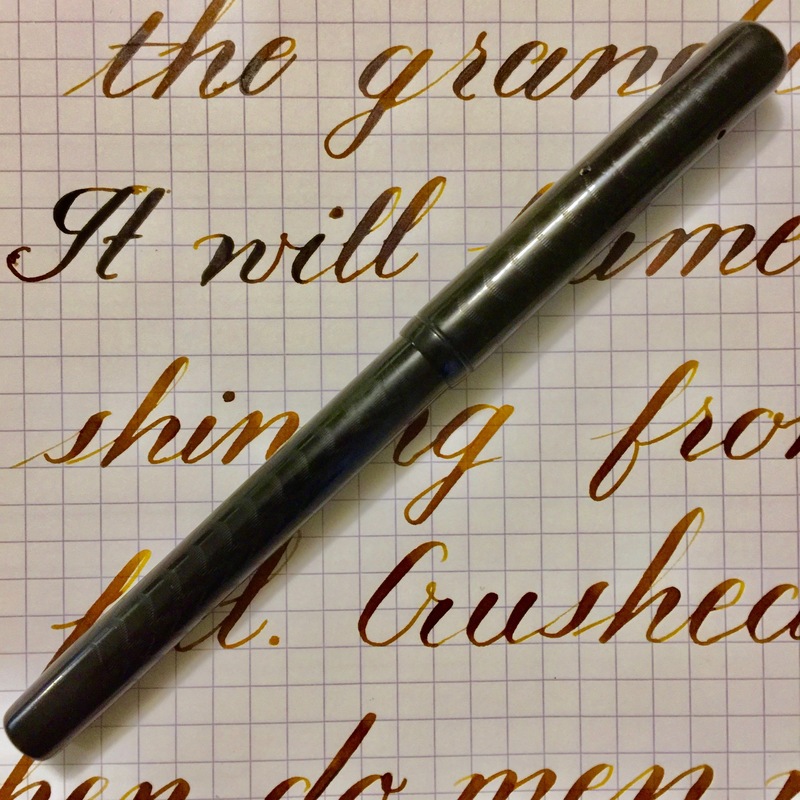 You just don’t find XF nibs this smooth. 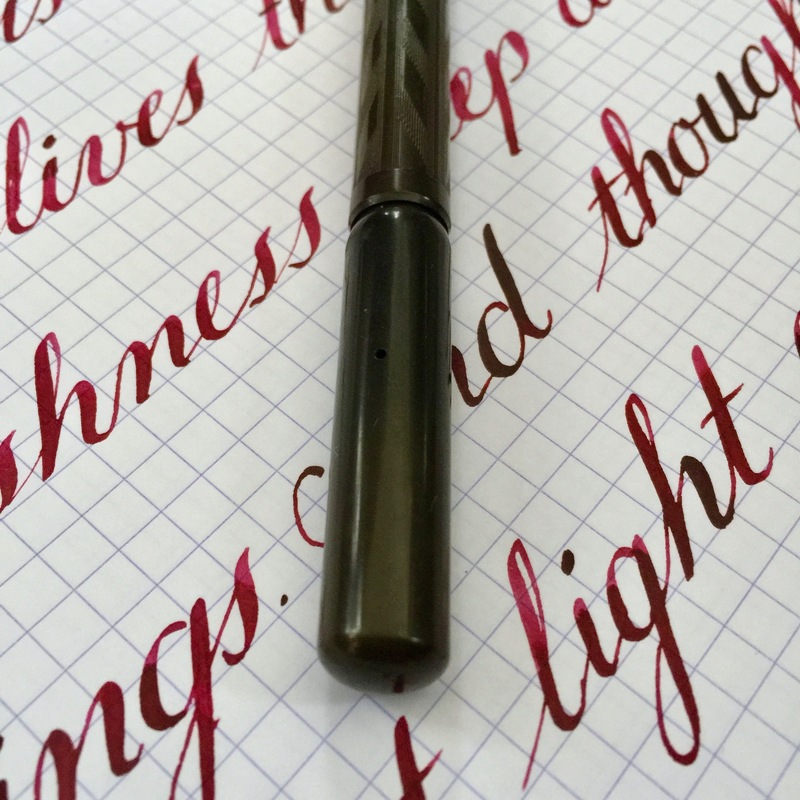 It’s pure joy to use. It also has very good flex ranging from XF-BBB (0.3mm to 1.6mm). I have graded this as a super flex, but I would say it’s a lower tier super flex. That is, it’s closer to a “good flex” grade than a “wet noodle” grade. Still, it’s extremely hard to find these in such a good condition and the overall writing experience is phenomenal.